A homestay on Amantani Island on Peru’s Lake Titicaca is a great way of getting to know a bit about the local Aymari culture of the region. The people that offer homestays have a spare room which will be simply furnished, but comfortable. There will be washing facilities of some kind, and a toilet. This homestay scheme has been a really great success story for the local community as it brings in an income to people who struggle to otherwise bring in funds without leaving their homes. Everyone involved takes turns in hosting guests, so it’s kept fair. Importantly though, it is also a success for visitors too. Of course some families are more chatty than others, but you should find that your host is very welcoming and will make your stay as good as possible. It is often a highlight for many of our clients. The homestay takes place on Amantani Island on Lake Titicaca. The island is best visited when you are staying in Puno by the lake. The Amantani homestay is available all year. The homestay is included as part of an excursion to Lake Titicaca. 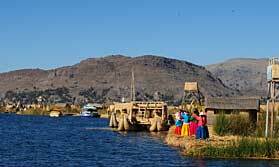 You leave Puno in the early morning, first visiting the Uros Islands before crossing the lake to Amantani. You are introduced to your hosts, a local family, and share a meal with them. The next morning, after a family breakfast, you depart for Taquile Island where you have lunch, before returning to your hotel in Puno.